Renee Rouleau Detox Masque Review (2018): Is It Worth Buying? What is Renee Rouleau Detox Masque? Renee Rouleau Rapid Response Detox Masque, US $60.50 for a 50 ml jar, is a face mask that has been specially prepared for people who are embattled by acne, supporting treatment but also promotes the prevention of future infections. However it cause skin redness or irritation. Renee Rouleau Detox Masque – Does It Really Work? What are the Ingredients in Renee Rouleau Detox Masque? Does Renee Rouleau Detox Masque Have Any Side Effects? This product is formulated by Renee Rouleau, the skin care brand that has been providing the specific care and treatment demanded by 9 very specific skin types. The brand’s creator is an esthetician who boasts of over 25 years of meticulously caring for other people’s skins. However none of this brands formulas are clinically proven. Promote skin clarity and a blemish-free complexion. Deliver antibacterial properties to help fight skin infections. Relieve your skin of irritation and other signs of inflammation. Provide a soothing, cooling and calming effect on skin. Melaleuca Alternifolia (Tea Tree) Leaf Oil: It has natural antiseptic properties that helps rid your skin of infections to deliver acne treatment while simultaneously proving protective functions to help you avoid future infections. Leptospermum Scoparium (Manuka) Branch/Leaf Oil: It has anti-microbial properties that promotes the treatment of skin infections as well as prevention of future breakouts. Betaine Salicylate (2% Salicylic Acid Complex): A salicylic acid complex made with 2.0 per cent of BHA that works by exfoliation, clearing your skin. Hyaluronic Acid: It causes your skin to visibly appear dewier, fuller and more supple as more moisture is drawn into your skin from surrounding tissues or the atmosphere. However sometimes it causes bruising, redness and itching on skin. Allantoin: Deeply hydrating, it also has skin calming functions that relieve your skin of inflammation to promote a more even skin tone. Cleanse your skin thoroughly before applying Renee Rouleau Detox Masque. Quickly spread evenly all over your skin to relieve irritation. Leave on for 15 minutes before rinsing off with lukewarm water. Pat dry and immediately apply an intensive moisturizer to help bring back your skin’s lost moisture. This mask is also recommended for use as a cleanser. Renee Rouleau Detox Masque does not contain parabens, phthalates, artificial fragrances and dyes, and drying alcohols that can be sensitizing to the skin and possibly detrimental to your overall health and well-being but it Hyaluronic acid which causes redness or itching on skin. The product easily rinses off, immediately removing excess products left behind after the treatment period. This product may not be suitable for use on all types of skin plagued by acne. 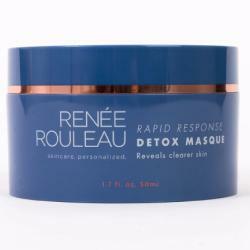 Renee Rouleau Rapid Response Detox Masque reviews posted by users are severely limited. It contains Sodium Hyaluronate which causes redness or swelling. It also contains Hyaluronic acid which causes redness or itching on skin. Skin irritation and allergic reactions due to several ingredients, including salicylic acid, and a long list of botanical ingredients. Increased risk for photoaging due to photosensitizing components added to the formula. Renee Rouleau Rapid Response Detox Masque appears to be an anti-acne product that can actually be used by people who have highly sensitive and reactive skin. In spite of the recommendation for all skin types, however, this product may not be suitable for everyone as it causes skin irritation or redness sometimes.It offers 45 days return policy.